We had a lovely Thanksgiving at our house. I hope the same was true for all of you. The boys managed to play quietly, and I don't think the television was on for more than an hour today. Quite remarkable, really. Stuffing: This was not precooked--they provided a tin, breadcrumbs, and turkey broth vegetable mix. I am sure this would have been adequate, but I realized I am picky about my stuffing--I have to have sausage! And celery! and onion! And raisin bread! So, I basically ended up making it myself after all, except for the seasoned broth they provided. Grade: B for effort. Broccoli, Cheese, Rice Casserole: With all the other starch in the meal (potatoes, stuffing, bread), I don't really get why they put rice in the bottom? We realized after we cooked it that we actually like our broccoli just plain and steamed. B for effort--not really their fault we are picky. Gravy: Again, adequate. Nothing wrong with this the way it was...but my pan gravy tastes better. Probably because I use most of the drippings instead of just a few tablespoons. My gravy will kill you faster, but you'll enjoy the experience. Grade = B.
Cranberry Sauce: This was also fine, but we preferred the canned stuff. B for effort. I made my sister-in-laws mapled sweet potatoes--YUM! Sadly, I learned my sons don't care for this dish. Oh well, more for me and DH! Homemade apple pie was touch-and-go whether it would happen or not, but Teddy's enthusiasm swayed his father into action. It didn't hurt that Teddy peeled and chopped all the apples, and the crust was store-bought. Overall, would I buy the Nob Hill Thanksgiving Dinner again? Probably not. 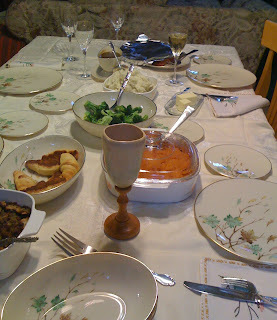 Other than the turkey, the parts of the meal that were spot-on for my family's palate were the easier dishes, which we would likely just buy anyway. It was certainly less work, though almost as many pots and pans. However, with a whole day to do the cooking, and one son who willingly helps, I think we'll just take it from scratch next year. The one part that was more than just adequate, was the feeling of gratitude, and the cooperation we had all day. DH and I partnered well in the kitchen, Teddy helped by making breakfast, and eating enthusiastically, and Barley had not a cross word for anyone all day. Give Thanks indeed.